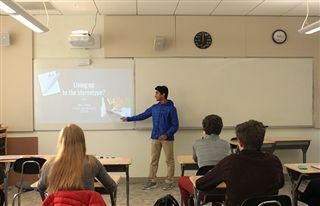 Prior to the assignment, Renolds invited Director of Equity, Inclusion and Cultural Competency Joan Edwards and student counselor Chasity Rodriquez to give the students a deeper dive into the topic. “Some kids have trouble acknowledging that microaggressions are real and that they are implicitly involved in them. We all have blind spots that we have to shine a light on. It’s important that we take this learning seriously and actively bring it to our community of students so they can become more empathetic and compassionate people,” Reynolds said. Reynolds shared a document with his students outlining the themes of the various microaggressions and the messages they send including ascription of intelligence (“You are a credit to your race.”) color blindness (“I don’t see color.”), assumption of criminality (crossing the street when approaching a person of color), and sexist language among others. So that the students were invested completely in the project, he allowed them to develop their own grading rubric which is comprised of a daunting, well-delineated 29 requirements (eye contact, thesis, volume, diction) and the means to meet the standards, graded from unsatisfactory to mastery. “What better way to have the students fully understand the assignment than to come up with their own rubric. There's no question in their mind how they can get an A.” Even Reynolds admitted that the students were tough taskmasters when creating their own rubric and that they have high expectations for one another. Each student delivered a solid, well-researched presentation that was informative and persuasive. The most affecting aspect of the presentation was when the students narrated their own personal experiences of a microaggression. One female student said her teacher assumed that she was less capable than her male counterpart, although she was perceived as more organized. She shared how even in a Google search of images associated with "organization," the most common images appear of women. An African American student described the obvious discomfort of a white woman by his presence while he shared an elevator ride with her and how he tried to put her at ease by speaking with her about the weather. A self-described “gamer” said that people pathologize the cultural values of gamers based on perceptions that gamers are abnormal and more prone to violence because of video games.